So I'm having an issue where I have a tag for server moderator and I want them to be able to edit channels. For the longest time, even when I had their i_channel_permission_modify_power set to 70 and i_channel_needed_permission_modify_power set to 70, I kept getting an error. I quickly realized that they couldn't edit channels because they didn't have i_permission_modify_power. I set their i_permission_modify_power to 70 and they still couldn't edit the channel (note that the channel itself in the modify category is 0.) Once I set their permissions up to 75, they could edit channels again like they were supposed to be able to, but then I noticed that they could edit channels that I did not want them to be able to edit (staff offices.) Their overview of permissions is in the picture below. I really need help figuring this out. I had the same issue with another lower moderator group and the easiest fix for them was to remove viewing channel permissions so they could not edit channels. Why does this group has i_channel_needed_permission_modify_power assigned? This permission belongs into a channel only. 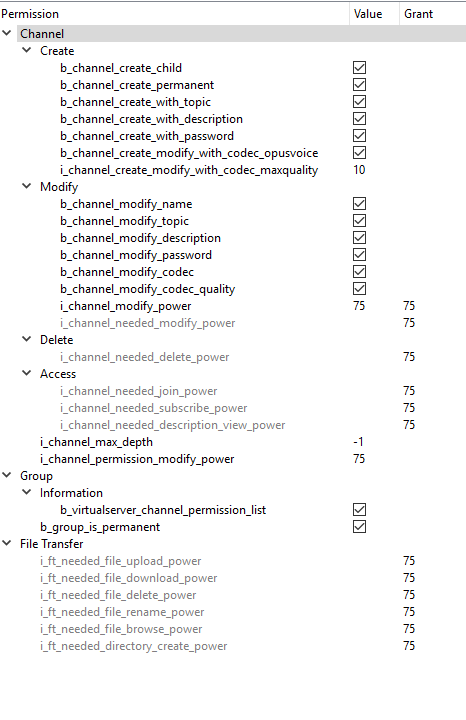 I_permission_modify_power isn't needed in case they only should be able to edit channel permissions. Your group needs more permissions to edit channel permissions. Please have a look at Post #35 for an example. I can not see a mistake, maybe the permissions are overwritten somewhere. Please show us a permission overview (right click on user -> permissions -> permissions overview -> then select "export as text"
Hint: Please do not create another thread (with exact same content/topic). These will be handled as duplicate and removed from forum. I have attached the overview with the user haveing the guest server group and member server group, both being how the perms were tested. Please add a 50 or 75 into the permission i_permission_modify_power. Leave Grant on that permission empty. This should do the trick. I better update the example. Do I want to add i_permission_modify_power to the channel group or the server group? Edit2: After some testing the group will allow the user to edit the perms on a already created channel but not allow them to change them on creation. Slightly annoying but my members can deal with it for now. Edit3: So, they are able to edit the permissions now but I'm not able to limit how high they can set the permission. Last edited by GenericGames; April 28th, 2017 at 07:35 PM. I have a probleme with my server. Why my group admin can't change value ? Where is my error ? If i activate b_permission_modify_power_ignore the group admin can change value. An idea of my problem ? [Resolved] Channel group / channel permissions affecting server group? Assign non-default channel group when user joins channel.